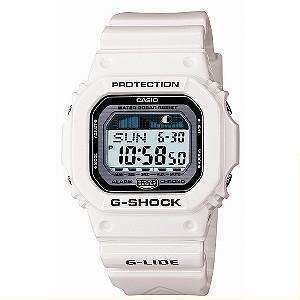 Casio G-LIDE White Digital Watch GLX-5600-7ER. Introducing the latest addition to the G-LIDE line-up of sports watches. This fantastically compact model is packed with great features including moon phase graphs and a tide graph display for all you water sports enthusiasts. It also features a 1/100th Sec Stopwatch Countdown Timer Multi-function alarm and Auto-Calendar (to year 2099). Shock-resistant construction protects against impact and vibration. Water resistant to 200m. Complete with manufacturer s two year guarantee and G-Shock presentation box. Been after one of each of these for a while. Damn! I paid £90 for mine, wear it all the time. Definitely worth getting one at this price. think i got the last - bit small next to my giant orange king one but hey - subtle wins sometimes.